The country of Sweden is known for a veritable smorgasbord of things, people, and companies, known usually by acronym: IKEA, H&M, ABBA. Like its fellow Scandinavian nations, Sweden is a prosperous society, with a history of innovation. It also has a history of celebrating both the warlike and peace-loving aspects of humanity; the land that was once known as the home of the pillaging Vikings now gives out the Nobel Peace Prize, which was established by the man who invented dynamite. Sweden is a large country, third in size in the European Union. Its capital, Stockholm, calls itself the Capital of Scandinavia. 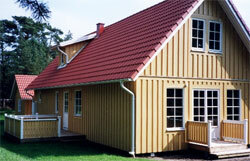 It is Sweden’s political, economic and cultural heart, a beautiful city spread out over 14 islands in the Baltic Sea. There is so much to explore in Sweden, with its archipelagos made up of thousands of islands, its extensive forests, its snow-capped mountains and large glaciers, its crystal-clear lakes and waterfalls. For a northern country, its climate is quite mild and pleasant. The northernmost part of Sweden is above the Arctic Circle, and the amount of sunshine the country gets depends on the time of year and varies with each region. Sweden is a highly industrialized nation. It is a major exporter of machinery, and one of its biggest companies is the car company Volvo. Despite the country’s favourable weather, Sweden’s rocky landscape does not lend itself well to agriculture, and only a small percentage of Swedes make their living through farming. Almost half of the country’s arable land is devoted to grain production. Forestry and mining play bigger roles in the country’s economy, and Sweden is a top producer of forest products (paper and pulp) and iron ore. The biggest employer by far is the services sector, both private and public. This is not surprising, as most schools, medical centres and child care centres are state-owned. Sweden is a welfare state, known for its cradle-to-grave care of its citizens—and the high taxes to pay for it. Sweden boasts one of the highest standards of living in the world, yet has investment property prices that are among the lowest in Western Europe.